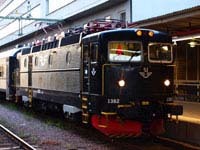 The information below applies primarily to travel on Swedish night trains (www.sj.se), but much of the article is also applicable to train travel in Finland (with www.vr.fi) or Norway (www.nsb.no). Have you booked one of our dog sledding, ski touring, canoeing or hiking experiences in the far north of Sweden? If so, you’re probably considering travelling by night train from Stockholm, as this is a great way to access the far north. But if the prospect of 18 hours on a train in an unfamiliar land seems a little daunting at first, don’t worry, we’ll talk you through it. Travelling by night train is fun! Photo: Bob Carter Nature Travels. 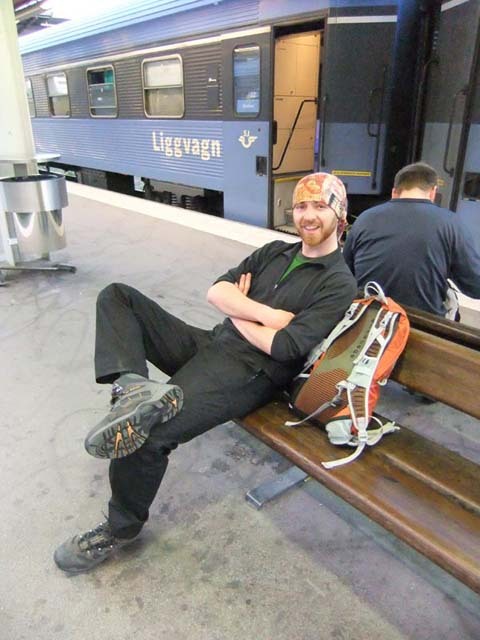 For our hiking and ski touring experiences in the north of Sweden as well as our canoe tours in Rogen in north-west Sweden, the tours are specifically timed to meet night train arrivals/departure and so train (plus sometimes a connecting bus) will be by far the most common option to travel to/from these tours. For other options, such as dog sledding in Swedish Lapland, it is also possible to travel by domestic flight from Stockholm, but train can provide a great alternative. There is an important environmental benefit – typically CO2 emissions per passenger are 50% lower for train travel compared to flying. Depending on flight fares available, the train can be a more affordable travel option, with significant reductions available for families and young adults. 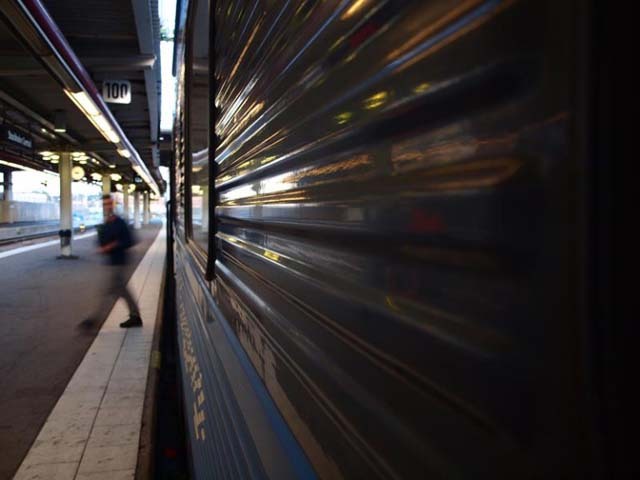 As night trains heading north normally leave in the evening, they allow a wide choice of incoming flight times to connect with the train, which can help to keep travel costs down. Going by train gives you a much better sense of the distance you are travelling and the remoteness of the destination compared to flying – many guests see taking the train as part of the adventure. Exact connections vary depending on dates and of course where you’re travelling to, but normally one of the two daily night train services north are direct. Once you’re on the train, just relax and enjoy it! Taking the overnight train may avoid the cost of additional overnights before or after your tour, which may offer a considerable saving. Photo: Euan Turner DMh Photo. Arrive in good time to board your train and get settled in. Particularly if travelling north from Stockholm Central station (Stockholm C), you may well find that the train begins from your station, so may be waiting on the platform some time before departure. Your carriage number/seats will be printed on your ticket – trains can be very long so you may have some distance to walk along the platform. Depending on the options offered when you booked, you will either have printed out an e-ticket or used your booking reference to collect your tickets from an automat at the station. You may need to show ID in connection with your ticket. Getting hungry? 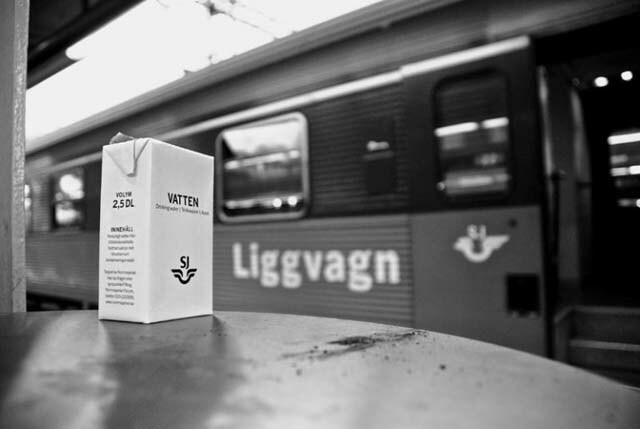 Although most guests very much enjoy the train journey itself, we do sometimes hear that the food on offer left something to be desired (Swedish trains have something in common with trains in most other places in the world in that respect). So plan ahead by stocking up before you board on your favourite picnic supplies for dinner, breakfast and in-between snacks and drinks. Phone/tablet/laptop and charger. The compartments have charging points (don’t forget an adapter for European sockets). If you favour 21st century entertainments, download some of your favourite movies/TV shows to watch offline (bring some earphones to avoid disturbing other travellers). If you’re bringing valuable or fragile electronic equipment, though, ensure you’ve planned how this can be stored/transported/protected during your tour – an expensive laptop and a bumpy dogsled are not a good combination (and you probably won’t be able to charge it while you’re on tour anyway). Don’t forget the value of good, old-fashioned conversation. 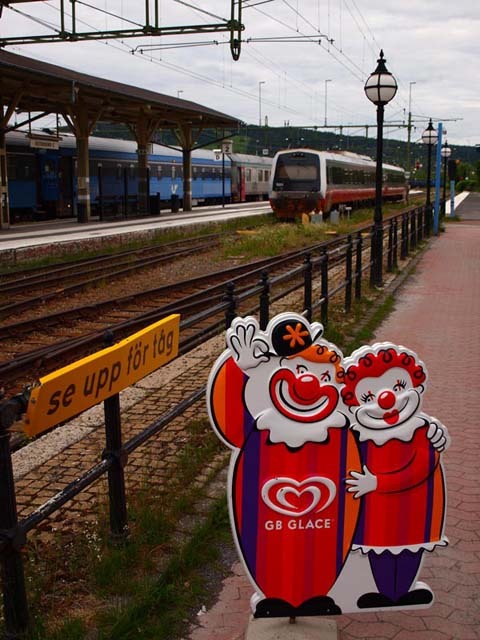 Train journeys can be a great opportunity to spend quality time with friends and loved ones or to make new friends of your fellow travellers – English is widely spoken to a very high standard throughout the Nordic countries. As night trains will normally leave in the evening, before long bedtime may be approaching. The sun may be setting, or maybe not – in high summer it may not set at all, and in midwinter it may never have risen! – so it’s time to prepare the compartment. The great thing about a train is that you can lie down and sleep! 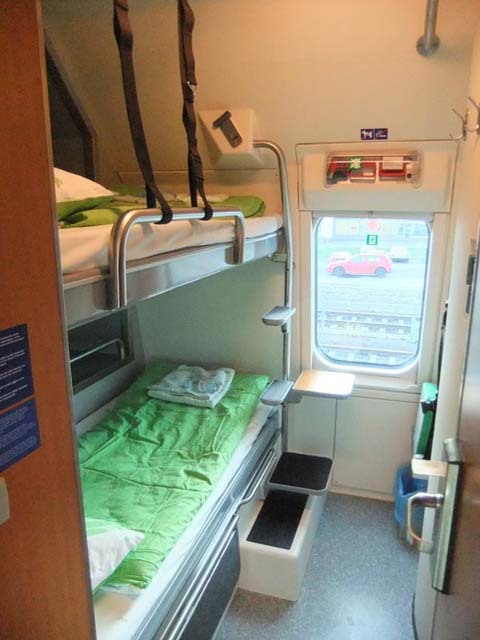 The standard night train tickets are 6-berth sleeper compartments. You can book spaces in male, female or mixed gender compartments. You can of course also book a seat only in a “normal” seats-only carriage on the night trains, but we don’t recommend this for any but the hardiest or most budget-conscious traveller. During the day, there is seating for 3 persons on each side of the compartment. Luggage is stored up above the door or perhaps under the seats. When it’s time to go to bed, the seating in the compartments converts to three bunks on each side. The part of the seat you have had your back against during the day folds up and locks to become the middle bunk. The headrests become simple pillows and you are given sheets and a light blanket as bedding, providing basic but comfortable sleeping arrangements. Our Train Top Tip: the top bunk is always “down”, so if you’d like the freedom to go to bed earlier than your travel companions (and not to have to get up before you want to) and so you won’t be disturbed by others climbing past you in the night, book a top bunk. You can specify this option when going through the online booking process. If you’re travelling as 4 or 5 persons and would prefer not to share your carriage, you might find that you can “book out” the whole compartment to have it to yourself for just a small addition to the total fare – this option will be offered if available during the booking process. 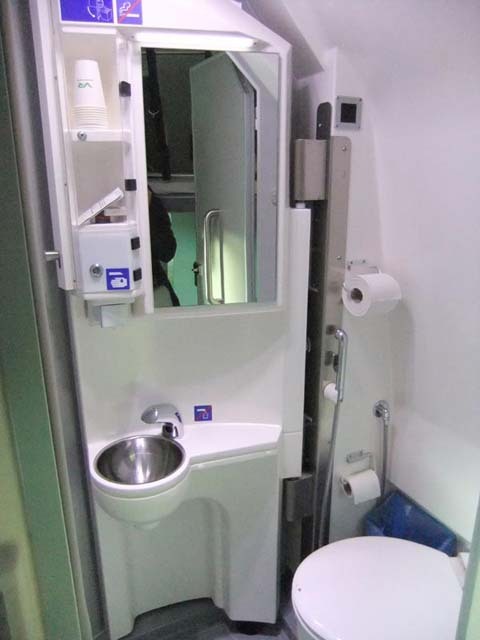 You can also upgrade to higher standard sleeping compartments (usually for 2-3 persons), which have “proper” beds and bed linen and may also have en-suite WC/shower facilities. Sometimes the additional cost for upgrading compared to a standard fare is surprisingly little. Hopefully you’ve had a wonderful night’s sleep lulled by the clickety-clack of the train on the rails. The sun is rising (or again, perhaps it’s summer and it never set or midwinter and it won’t rise at all) and it’s not too far to your final stop. Everyone is up getting their belongings together and you can start to pack the bunks away and return them to seat form. The train guard will probably have discussed where you are getting off when they checked your tickets and will normally come round in the morning to make sure you’re awake in good time to prepare to disembark when the train arrives. But to be on the safe side, don’t forget to set your alarm! As the train is rolling into the station, you say your farewells to your fellow travellers and wish them luck on their journeys. For you now, a new part of the adventure is about to begin. For night trains, bookings are often open several months in advance and you should buy your tickets as far in advance as possible for the best fare and can be very affordable if you plan ahead – fares may increase significantly depending on demand the closer you get to your travel date. The travel file we provide for your chosen tour will give more detailed information relevant to your particularly destination. Also, bear in mind that there is normally no price disadvantage in booking a single journey compared to a return – so if you’re short of time or particularly wish to fly for one leg of your trip, you can choose to travel by night train only in one direction of your journey. For all our experiences. we provide detailed travel planning information, including how to check and book train connections where appropriate. Although we don’t book travel, we’re happy to offer assistance with any aspect of planning your journey, including giving a suggested travel plan if you wish.